Like any other precision measurement tools, groove gages have undergone a tremendous change from mechanical scales to being digital marvels. Today, groove gages are applied in hundreds of critical applications to measure the depth of recesses, slots and centerbores, as well as locations and heights of some features. They are very common in the tool and die industry. If you are looking for a groove gage that can determine the tolerance of a workpiece within a short time, you need to consider the Dyer Gage 651 Series Electronic Groove Gages. While they are designed to be lightweight, these tools are made from rigid cast frames which makes them suitable for virtually any applications. Whether you seek to measure groove thickness or groove diameters, the Dyer Gage 651 Series Electronic Groove Gages are must-have tools in your workshop. Let’s find out more about the Dyer Gage 651 Series Electronic Groove Gage and the company behind this fine product. The Dyer Company is a world class manufacturer of min-wall/thickness gages, groove (external and internal), precision bore and custom application gages. This company has been declared as a technical leader when it comes to gage tools since their products are designs to offer fast, accurate and durable solutions. The Dyer Company manufactures a variety of groove gages all designed to fit different industrial applications. 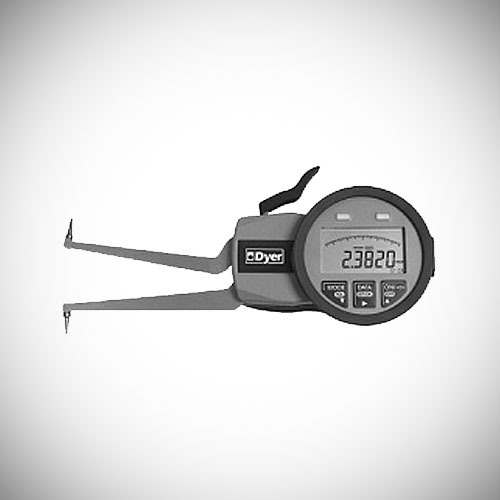 The most common groove gage from Dyer is the 651 Series Electronic Groove Gage. This model is particularly used by most mechanical and plumbing companies to perform high quality installation, fabrication and services on numerous projects. Get Dyer Gage 651 Series Electronic Groove Gages from Willrich Precision! Looking for groove gages? At Willrich Precision, we offer a wide range of groove gages from reputable brands, including the Dyer Gage 651 Series Electronic Groove Gages. You can trust us to provide excellent equipment for any projects and our products work perfectly for different applications, including technology, automotive, metals and machining, aerospace, medical and many more. We have more than 40 years of experience in the field of gaging, inspection and metrology and we partner with big manufacturing companies to offer durable solutions. Furthermore, buying from us is so easy. All you have to do is purchase from our online platform where you will find our staff who will be more than happy to assist you through the process. If you have any questions about any of our products, we have a team of specialists who are willing to share their vast knowledge and also assist you pick the right groove gage that will fit your applications. For more information about the Dyer Gage 651 Series Electronic Groove Gages, don’t hesitate to contact our Willrich specialist today!